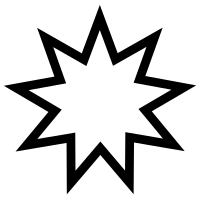 Bahá'ís are monotheists (which means that they believe in one God). They believe Bahá'u'lláh carried a message from God. Bahá'u'lláh said he was not the only person to carry a message from God, and he was not the last to carry a message from God. He taught that the people who started the other major religions also represented and carried messages from God, such as Jesus, Moses, Abraham, Muhammad, Krishna, the Buddha and others. He called these people "Manifestations of God." They believe the messages from the Manifestations of God get more and more difficult to understand. They say the ones that came earlier on had a more simple message than the ones that came later. Because God is greater than the whole universe, Bahá'u'lláh said that human beings cannot completely know God. He said that God wants people to know as much about him as they can. Bahá'u'lláh wrote God sends special people to manifest (show) himself to ordinary humans. Without the Manifestations of God we could not know God. Bahá'ís believe the God they pray to is the same God Abraham spoke to, Jesus talked about, and Krishna said in Gita. Since Bahá'u'lláh was born in a Muslim family, Bahá'ís are sometimes mistaken as Muslims. 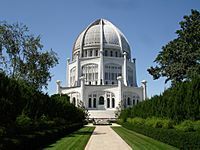 Bahá'u'lláh is considered the prophet/manifestation of the present day. Bahá'ís say that he is not the last prophet/manifestation of God. They think there will not be another prophet for 1,000 years after Baha'u'llah's death. Bahá'í gardens in Haifa, Israel. Bahá'í Faith Facts for Kids. Kiddle Encyclopedia.